The biggest question still plaguing Schrödinger’s wave equation was the role of the wavefunction. Sure, mathematically it’s clear: it’s the solution to Schrödinger’s wave equation and the “all-powerful function” as a result. However, physically it was still a big mystery to everyone, including Schrödinger himself. Max Planck (1858–1947) was born in Kiel, (in modern day Germany), the sixth child to the distinguished jurist and professor of law at the University of Kiel, Johann Julius Wilhelm Planck and his second wife, Emma Patzig. His family culture would bestow in Planck’s life and work a sense of excellence in scholarship, incorruptibility, idealism, reliability, and generosity. In 1867, when Planck was nine, his father received an appointment at the University of Munich. The family moved and Planck enrolled in the city’s Maximilian Gymnasium where his interest in physics and mathematics was piqued. However, Planck excelled in his other studies as well, in particular music. Thus at the time of graduation, now 16, Planck had the difficult decision of choosing a future in either music or physics; he chose physics. Einstein’s 1916-7 approach was as close as anyone got to a full quantum derivation of Planck’s Radiation Law, until an unknown physicist from Calcutta, India revisited the problem in 1924, and created the area of quantum statistics. In 1925, Einstein made his last contribution to quantum theory (consider by many to be his last significant scientific contribution as well) with his work on the quantum ideal gas. After 1925, Einstein turned his back forever on quantum mechanics, arguing that its probabilistic nature was a fundamental flaw. If in 1917 Einstein truly saw the probabilistic nature as a shortcoming, later he would be less forgiving. Einstein’s 1905 paper, On a Heuristic Point of View Concerning the Production and Transformation of Light is often (wrongly) referred to as his paper on the photoelectric effect. In his1905 paper, On a Heuristic Point of View Concerning the Production and Transformation of Light, Einstein showed how his newly introduced light quanta hypothesis could be used to interpret several well-known experimental observations, the most notable of these phenomena being the photoelectric effect. The major theme of Einstein’s 1905 paper, On a Heuristic Point of View Concerning the Production and Transformation of Light, was that light (under certain circumstances) behaves as if it’s comprised of individual particles rather than waves. 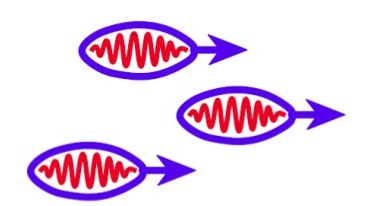 These particles, or “chunks” of light were originally called light quanta, and then later came to be called photons. It was the first of Einstein’s 1905 papers, On a Heuristic Point of View Concerning the Production and Transformation of Light, which he referred to as “very revolutionary” – the only time he would ever say this about any of his work, in fact – and which, in part would win him the Nobel Prize in 1921. At the atomic level, energy occurs as “chunks” or quanta. Transitions between the energy states of atoms and molecules require a specific amount of energy, nothing more, nothing less; it’s only these particular values that are allowed by nature. The energy states available to atoms and molecules occur at specific intervals. In other words, they are discrete rather than continuous. Quantum Theory was born in 1900 with the pioneering work of German physicist Max Planck (1858-1947).